This high school was constructed in the 50's and has been abandoned for more than a decade. It's dark and damaged by numerous intruders and the passage of time. 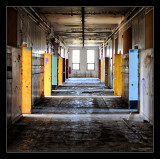 Love how these images take you on a 'forbidden' visit into this abandoned school... Fantastic project! Great pictures, makes you sort of sad in away. Is it me, or does there seem to be reasonable number of abandoned buildings in around Montreal? It just doesn't seem to be something that seems to be around for any length of time here. I work on buildings of similar construction and vintage in Toronto. You can certainly see how much education has changed and our society both morally and technology wise when compared with a new high school. Despite the obvious decay of the building fabric, in all likelyhood it could easily be revamped into proper 'living' building once more. Condos come to mind. Facadewise this something that just isn't in favour as a design in new construction, but loved for renovation work. Even though it appears to be completely abandoned some one, the city or the school board is keeping an eye on the place as the grass is mowed. You should also keep in mind that buildings of that vintage, with proper plaster walls, 1 x 1 ceiling tiles and tbar ceiling tiles of up to the mid 80's, frequently had asbestos in them. So I would highly recommend washing your cloths at a laundrymat and investing in a mask with replaceable filters (usually purple for asbestos). I hope to see more pictures of this site, especially the basement, all sorts of crap and neat stuff frequently gets stored in schools down there. Please be careful in the boiler room and be aware of sump pits. The photo with the red bench, is indeed a shop. Carpentry. You can tell by the type of vise on the close end of the bench. Any idea what is to become of the site? When time stop...Calendar shows September 1998...The school (The Building) stays...Abandonned and at the mercy of all kind of visitors...And the result is what these tremendous photos show...Words would not say more than awful...While the pictures say it all...Wonderful Photos... Gil.